To Work Out Your Best Fit, Click The "How To Custom Fit Your Prodi G Clubs Tab"
Wedge 52.0° Standard Length 32 1/2"
Wedge 56.0° Standard Length 32 1/4"
How do I work out the best fit for my child? 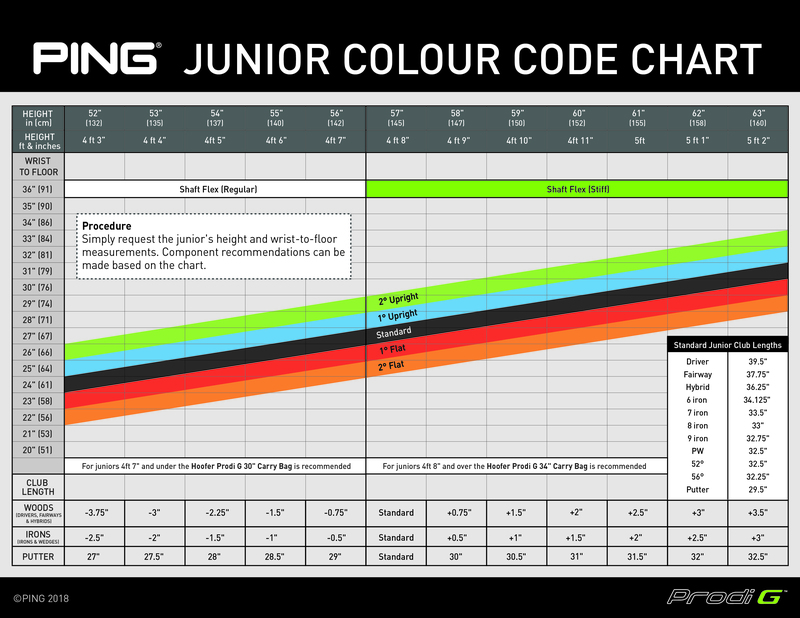 To make things nice and simple, use the below Ping Colour Code Chart to work out the best fit. You can print this out if needed which may help when you are measuring your child. 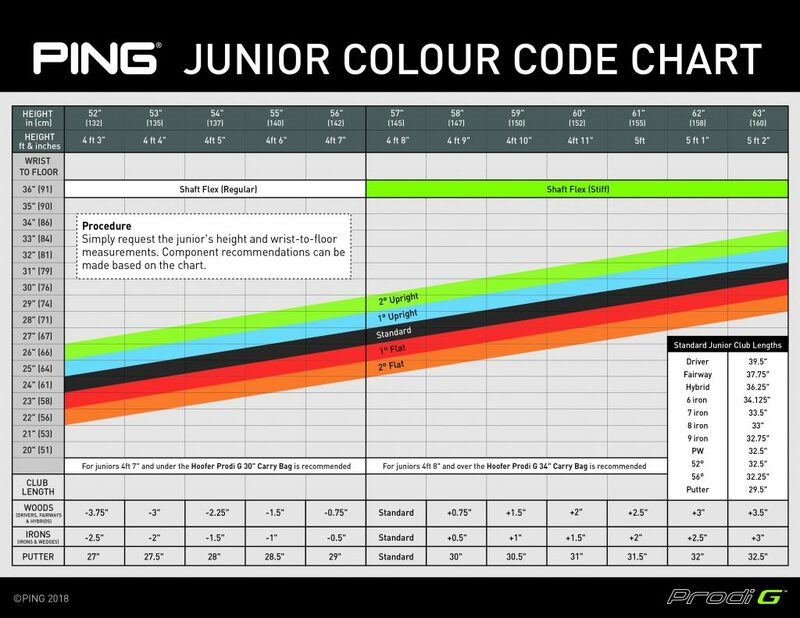 Working Out the Lie Angle (Colour Code) only needed for irons, wedges and putters. Step Two – Measure the overall height of the junior golfer in either inches or centimetres and find the measurement along the top of the chart. Again make sure golf shoes or something similar is being worn. Step Three – Using both measurements simply find the box where they intercept. As example, follow the row along from the wrist to floor measurement and stop when it intercepts the column of your overall height. This will then give you a colour. These colours refer to lie angles with green being 2 degree upright, blue being 1 degree upright, black as standard, red as 1 degree flat and orange being 2 degrees flat. If you do not produce a colour, then you need to either go down to green or up to orange! If you have two colours in the same box, go with the greater colour. Write this colour down as you will need it to order. What flex do I need? - By using the same method as above, look again at the box that the two measurements meet. Looking up to the top of the chart, you will see the shaft flex as either regular or stiff. Again, write this down as you will need it when ordering. What length do I need? - Using the same method, look again at the box that the two measurements meet. Looking to the bottom of the chart, you will see the +’s or -‘s that needs to be added or taken off a standard length club. There is separate results for (Drivers, Fairways and Hybrids), Irons and Putters. Again, write this down as you will need it when ordering. Can I get some advice to check my measurements? Yes, our professional staff are on hand from 9.30am to 4pm daily on 01626 830537. Give them a call as they will be happy to help.